Hi …Could you help me turn on sgminer with Intel 4600 graphic card.I have new build up desktop motherboard Asus Maximus Extreme VI, cpu Intel Core i7-4770K…Any help will be great. I have problem to start sgminer using only Intel 4600 interg. 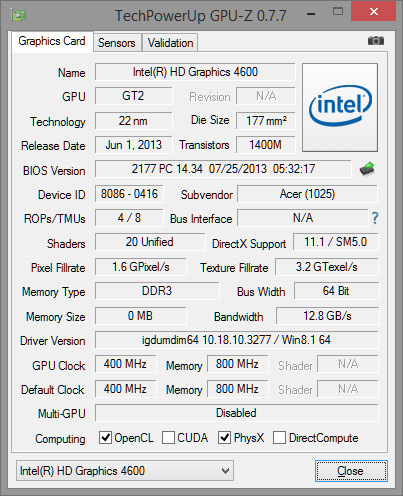 graphic card …..As far I know from GPU-Z My Intel 4600 have now GPU default 350 MHZ and clock also 350 . Memory 800 Mhz. Hello, could your please name a few miners compatible with intel HD 4400? Someone managed to mine with the intel ?? ?